Common engineering concrete mixing station is designed specifically for a certain project, and the engineering has the features of security, stability, environmental protection, energy saving, and intelligent. The different station can meet different engineering requirements. 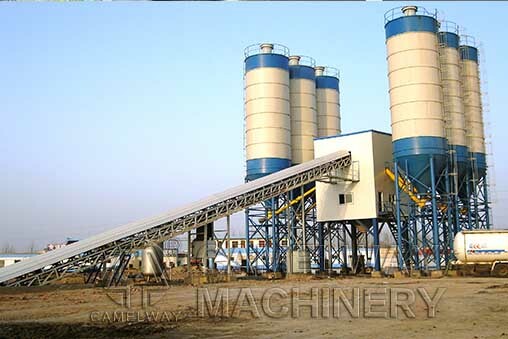 The main models have HZS120, HZS180, and HZS240 concrete mixing station. Trough type conveyor belt, cover an area of an area small, high transmission efficiency. Unique back burning on machine, completely solve the problem of blanking trough belt. Sealed connection avoids spiral influence on powder. The reasonable ventilation design can balance powder according to pressure, which effectively ensure the accuracy of meter. It can automatically and accurately meter liquid. Mixing system: adopt forced double shaft mixer, which is efficient, wear-resisting and has long service life. Fully automatic, semi-automatic, manual three works, make production control more easily; Omni-directional real-time inspection equipment production status; Collect classified report query can be customized; Remote services, real-time, quickly. If you are interested in concrete batching plant or mixing equipment, please feel free to contact us at any time. Welcome to leave a message in the below, we will give you a reply in 24 hours. This entry was posted in Cambodia Batching Plant, Solution and tagged concrtete mixing station by camelway. Bookmark the permalink.